This is the third media briefing and second issued today following the wonderful news that the missing boys and their football coach have been located underground. This additional media briefing follows on from one circulated by BCRC on 28 June 2018 and earlier today (BCRC Update 2). This briefing reports on the success of the search phase of the operation in Chiang Rai province and explains some of the considerable challenges as the activity of the operation shifts to ‘rescue’ of the boys from the cave. Please note that it remains BCRC policy not to confirm the names of the British cave rescuers, even though names have been stated in various media reports. We make a plea that the privacy of the British cave divers is respected, to allow them to rest properly in anticipation of long, hazardous dives during each day. Around 16:30h this afternoon, we started to receive the remarkable news that all 12 of the boys and their coach had been located in a dry air space south of the Pattaya Beach area of Tham Luang Nang Non Cave. It is estimated that they are around 200 m south of that underground landmark. Shortly after this news, we received a direct (but short confirmation) from our British cave divers of the joyful news that the lost boys had been located alive. Video footage of the boys and their coach has now been released and shown to families waiting on the surface. Two British, volunteer cave divers found the boys at their current location, but the last 36 hours have seen a coordinated and planned approach to the rescue being led by the Thai Military and involving many other nations (including the USA, Chinese, Australians and others). Equipment and air supplies have been ferried in to the system over the last day or so, enabling the divers to progress further in to the system than was previously possible. Diving lines have been laid to the boys’ location for other divers to follow with essential food, comforts and medical supplies. We believe that there is only a short break in the monsoon and all feasible options for the rescue of the boys are being considered. Although water levels have dropped, the diving conditions remain difficult and any attempt to dive the boys and their coach out will not be taken lightly because there are significant technical challenges and risks to consider. It is estimated that the boys are around 2 km into the cave and somewhere between 800 m to 1km below the surface. They are also located in a relatively small space and this would make any potential drilling attempt as a means of rescue very difficult. Back here in the UK, there is an assessment of electronic equipment that may be suitable to pin-point the underground location of the boys and coach with a greater degree of accuracy than the published surveys. The necessary equipment will be sent to Thailand if electronic experts agree on the feasibility that it will operate over such depths. Bill Whitehouse MBE, Vice Chairman British Cave Rescue Council (vicechair@caverescue.org.uk; 07836 593677). For general information on cave rescue, the character of active river caves and the particular challenges that face cave divers when they need to access dry cavern beyond flooded, river passages. Chris Jewell, British Cave Rescue Council, Cave Diving Officer (information on cave diving and underwater rescue, colleague of the cave divers in Thailand: diving@caverescue.org.uk +44 (0)7970 923 959). Gary Mitchell, Assistant Chairman, British Cave Rescue Council (general information on cave rescue and the particular challenges of a cave rescue operation in active river caves under flood conditions: assistantchair@caverescue.org.uk +44 (0)7866 802737). 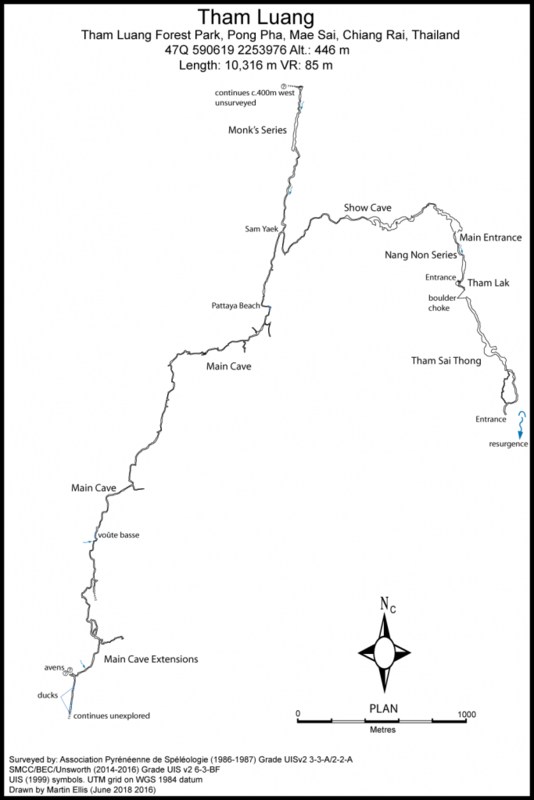 Cave survey of Tham Luang Nang Non cave which identifies the underground locations stated in the BCRC briefing reports (© thailandcaves.shepton.org.uk). Briefing prepared by Gary Mitchell (BCRC Assistant Chairman), edited by Peter Dennis (BCRC Chairman).